16 days of surgery, 200 operations and an airplane crash. 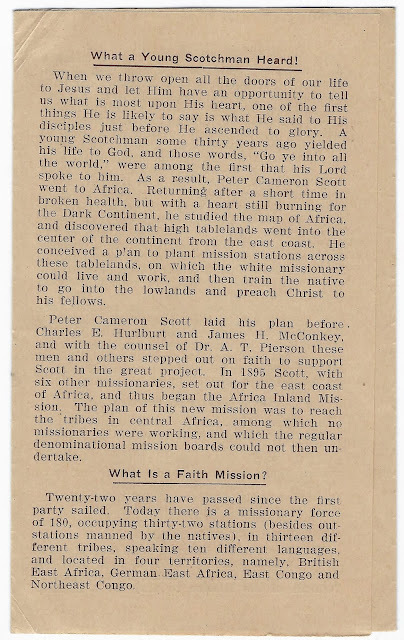 February and March of 1939 were full of adventure and excitement! Our last trip to Banda (1) for surgery was over fifteen months ago, when in eighteen working days we operated on 101 people. Soon after we left others began to arrive at that station wanting operations, and when told that we would not return for at least a year and maybe more, most of them said they would just wait anyhow, and so built little huts for themselves near the station and started gardens. Thus easily can they adjust themselves – a simple life! As the months passed more and more of them arrived until, when they got to be around two hundred Mr. Dix refused to put their names down in the book. That was four or five months ago, and Dix estimates that at least five hundred had come during the fifteen months. It was hard to find a time to get away for the trip, what with maternity cases, Christmas time, the children’s vacation and other affairs to keep us here. As it turned out we had to squeeze the trip into a comparatively few days this time, as first we had to wait for a meeting of the Field Council of which both Dix and I are members, and then we had to be back in time for Yoane Kusala, the head medical boy who went with us, to be here for a government medical examination which he has to take. That meant rushing to get through with as many patients as possible and rushing to get back; and now that we are back we learn that the exam will not take place for at least three more weeks and we have already been back a week! We wanted to take three medical boys along this time, one to act as “assistant surgeon” and two to take care of the post-operatives, but with all the supplies we had to take along there wasn't enough room in the car and so we had to leave one behind, much to his disgust. At the “last minute” too we found that we would have to invest in two new tires, and we were fortunate enough to be able to get them within a few days more or less “locally”, i.e. 100 miles. Well, to make a long story short, this time we found more patients waiting than we could possibly care for in the time at hand. However, things went smoothly and by the Lord’s enabling we were able to operate on 120 patients, about 50 of whom had double or triple operations, this time in 16 working days. This time also there was one death, a very old man who got along well after an operation for double hernia and elephantiasis but about two weeks later developed dysentery, which proved too much for him. A larger proportion of the hernias this time were comparatively early than at previous times, but a few that we turned down were so large that they contained more of the abdominal contents than the abdomen itself. One woman carried her hernia in a cloth that was slung around her neck and shoulder, somewhat as they would carry a baby, the kind that one book speaks of as “having forfeited its right of domicile.” The largest elephantiasis (scrotal tumor) this time weighed 78 pounds after removal and had hung to within a literal inch from the ground. An interesting feature about this case was that, in spite of the fact that there is usually considerable hemorrhage in such operations, there was a very marked sudden slowing of the pulse just as the tumor was being removed from the body, due probably to the sudden decrease in the load on the heart. All the cases were done under spinal anesthesia only, a great boon in such work out here. It makes it possible to do more cases during a morning than if one had to wait for the induction of general anesthesia in each case, and eliminates the need for an anesthetist or frees the nurse for her many other duties. It was interesting to note again that the people came from widely scattered areas and many of them from 200 or 250 miles away. Some had been waiting for as long as fifteen months and over half of them for more than six months. According to Dix, who is stationed at Banda, there is some real spiritual fruit evident as a result of previous visits, and all through his district new openings into villages have been made easy for him and his native evangelists. Some of the area from which the patients have come are as yet unoccupied by any mission, and the only Gospel witness they have had has been that received at Banda, or through those who have been there. After our time was up there were still left around a hundred people in need of help. About twenty of these were considered inoperable, and of the remainder about seventy said they wanted to go to Aba. That would mean a good three hundred miles to walk and some of these had already come over two hundred miles from the opposite direction. We didn't really expect that many of them would actually start for Aba. Two more weeks have elapsed since this letter was begun, and a few days ago we were surprised to see these people begin to arrive here. Sixty-four have come, besides ten or a dozen friends or relatives who came along to help. They had done the trip in three weeks in spite of physical handicaps, fair sized loads, and little food. How they managed to get food and shelter along the whole way is more than I can say, for in one of the groups there were around forty people, a large number to make their appearance at a village all at once. For a couple of nights we were swamped for sleeping space, beds enough being out of the question; but somehow they all found places to stretch out, on, under, or between beds all over the place. After one day of rest they got busy building little houses of poles and grass, and tonight they are serenely comfortable around their various fires. Photo taken by Ralph Kleinschmidt in March 1939. Reverse side of the photo taken by Ralph Kleinschmidt. Description written by Esther Kleinschmidt Meyers. things from the ship. A little while later, however, he began to act queerly and then became unconscious, and so he was taken here (Aba Mission Hospital). We sat up with him a good part of the night, but his injury proved to be not very serious and after a few days of rest in the hospital he went back to help salvage the plane. One day Coralee and I went with him and had a very interesting time seeing the huge machine. It is one of the very latest models, much like the transpacific “Clippers”, weighing 18 tons empty, and using three tons of gasoline in five hours – enough to last our car two years! One of the passengers, by the way, was a sister of Prime Minister Chamberlain (3). It is only five more weeks until the girls come home from school! And that’s another event! They continue to be happy down there and to do good work in school. The school staff will be short soon, as Mr. and Mrs. Winsor (4) are leaving for furlough. Their home is in Wheaton. Mr. W. is a brother of Mrs. Pierson. He is a very fine fellow and we certainly hope that you will get to meet him while he is in the States. We are expecting the Piersons (5) to arrive almost any day. They left America about three months ago on their return to the field. We have just heard that while driving up through Kenya from the coast their car was stuck in a river when suddenly a very heavy downpour caused the river to rise so fast that within a few minutes the car was nearly covered, and they barely had time to get out, and nearly lost their car and everything in it. I have not been able to locate Banda on the map. Mom says it's between Niangara and Asa. This photo was taken by my grandfather, Ralph Kleinschmidt, of the Corsair which crashed on the Dungu River on March 15, 1939. My mother remembers it vividly. 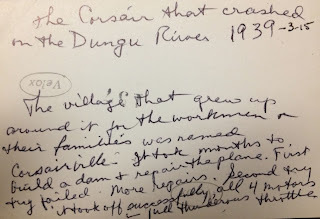 Here is what she wrote on the back of this photo: "The village that grew up around it for the workmen and their families was named Corsairville. It took months to build a dam and repair the plane. First they failed. More repairs. Second try it took off successfully, all 4 motors in full thunderous throttle." 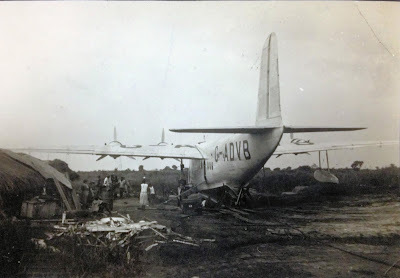 The story of this event is also told in "Corsairville - the Lost Domain of the Flying Boat" by Graham Coster. Mr. and Mrs. Winsor (Earl & Ada Rury). Earl was Mom and Edie's math teacher at Rethy. Ada was Earl's 2nd wife. He and his first wife Mary Park Winsor had two children, Faith and Austin. Mr. and Mrs Pierson (Floyd & Amy Winsor) were AIM missionaries at Asa at least 50 years. 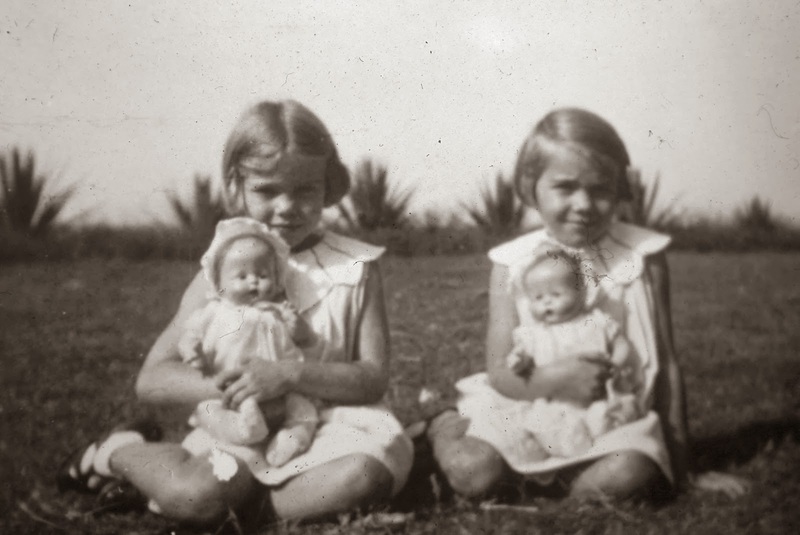 They had one daughter, Betty Lou, who married Paul Teasdale. 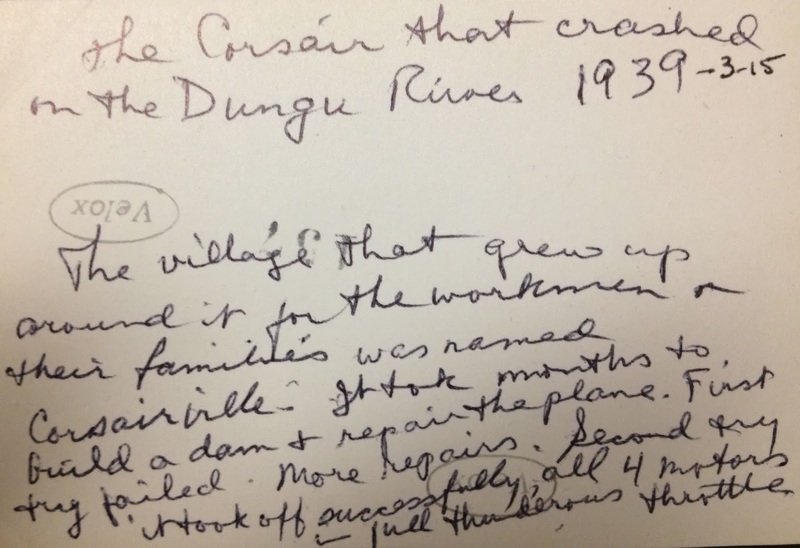 Written just one day later, this letter covers some of the same ground but since it was written to a branch of the family that had medical training, there are a few new details. We had hoped to get a letter off to you long ago, but there has been such a rush of things and it has been so terribly hot it just hasn't gotten done. Now Ralph is away and since I still haven’t learned to write on the typewriter I wonder if you’ll be able to read this. Airmail weight is so small and I hope you won’t mind this being crowded together. Thank you very very much for the lovely presents you sent us. The children were very pleased with their sweaters. Esther chose the angora one and it looked so nice on her. Edith found the blue one just to her liking and it was just the shade that is most becoming to her. Our Congo money fits in Ralph’s wallet just fine. He has it in his pocket on this trip. I am most grateful for the stockings. And so a real big thank you from us all. Our Christmas was a busy, happy time. It is always so grand to have our girls home again. They are such good little pals now. You will be interested to know that Edith fell while skating and a skate wheel hit her thumb and dislocated it at the first joint. She had a very painful time of it and since it was her right thumb it interfered with her letter writing. They notice the heat so much after the cool climate at Rethi. This is our hot dry season and it has been fierce, worse than St. Louis in August. Week after week it has made us very weary. We plan to leave the first part of February for another surgical trip in Azandeland. We will go again to Banda, 350 miles away. There are more than 200 operative cases waiting us there. Recently four new cases came there to Mr. Dix (1) and he said there was no chance for them, they might as well go back to their villages. There were so many ahead of them. They said give us a road pass and we will go to the doctor. They arrived here having walked over 450 miles. They are all convalescing now. Poor folks they will have over 300 miles to walk back home again. The medical work has been encouraging. Our cases are coming from far and near and many do not hear the gospel anywhere else. I have been having special classes with our more advanced medical boys for they will be taking their government exam next month. Three new boys have just come from some of our mission stations for training. We have 12 medical boys. There are many problems connected with them but on the whole they are a great help in the work. Recently the head medical boy (Yoane Kusala) went out to an outschool 14 miles away on Sunday and held a service. While there the headman of the village, a baptized Christian, had a hemorrhage from his lungs. Yoane took the sick man on the handle bars of his bike and brought him here. It is a rough gravel hilly road. We wonder how he ever did it. The headman is recuperating nicely. We are praying and longing for electric lights and X-ray. We need it so badly for so many cases. Ralph took our girls back to school on the 24th. I have missed them so terribly. I stayed behind because there is so much to see to. I have buried myself in work, it seems the only relief. Our girls hate to go but they are very brave about it for it is a sacrifice we must make in the Lord’s work here. He has wonderfully enabled. They are doing good work in school and have the highest averages in the whole school. I enjoyed their music so much while they were home. They were discussing what other instrument they want to play. I think they have about decided on violins (2). Ralph expected to visit the dispensaries at several of our mission stations on his way back. I know he joins in sending our warmest love and thanks for all your kind help and the many joys you have given us all through the years. We send our best wishes too. 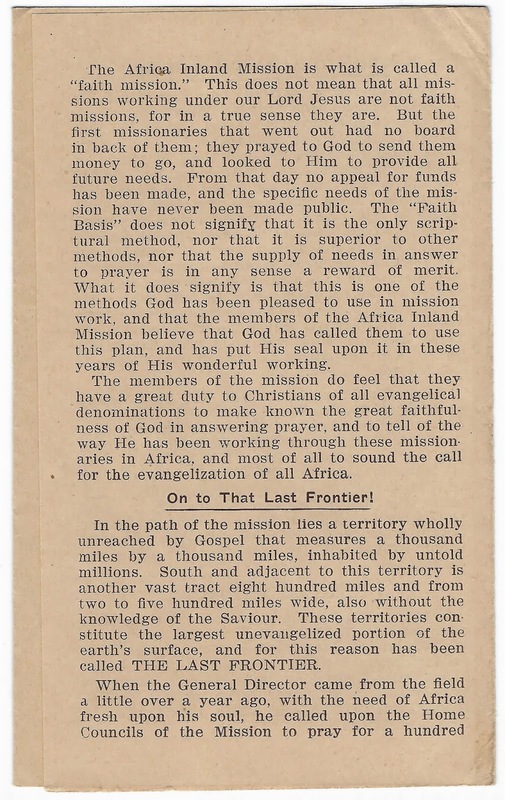 Mr. Dix was a pioneer missionary with the Africa Inland Mission. I've linked to a page in "Gifts from the Poor", and quote here from that book. 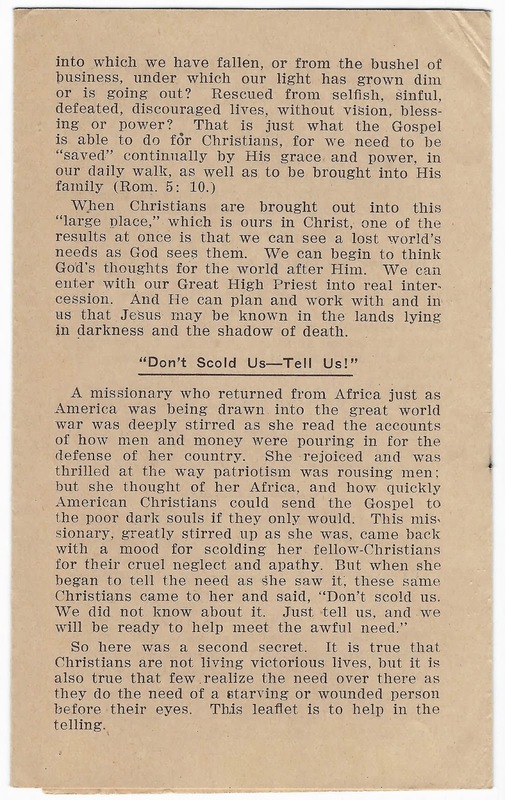 "Earl Dix, a self-described farm boy from Butte, Nebraska, was twenty-five when he felt "God's leading" to become a missionary. 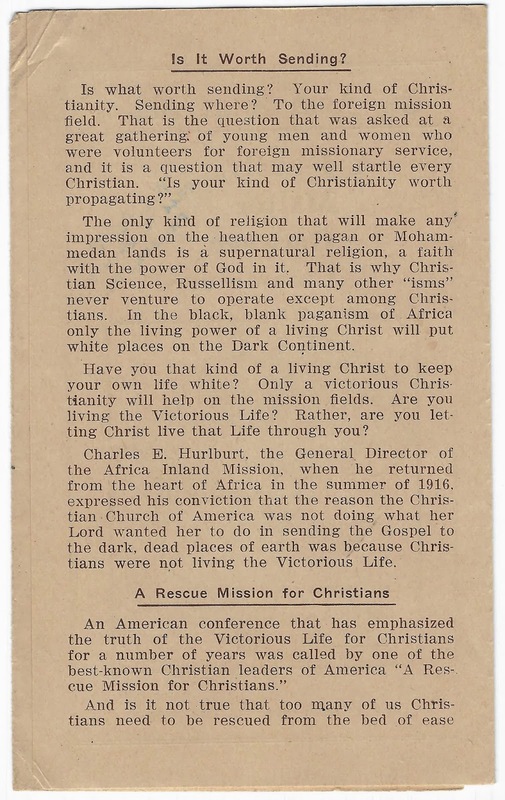 In 1929, with his fiancee Helena, his "varmint rifle" and a few other worldly goods, Dix sailed to Africa. The couple established a mission outpost on a hill in the village of Banda, building first a church, then a school and then a hospital. During more than a half century of services, Dix (who died in 1983) became "Papa Dix" to his flock. He tended not only to their spiritual needs but their physical ones with meat from the big game he hunted. Learning that the root of the local Rauwolfia plant was the source of a drug used to treat high blood pressure, Dix sent locals into the bush to gather it. Then he sold it to European pharmaceutical companies. With the proceeds, Dix paid for mission projects including students' school. He even sent a few young men away for specialized medical training." Mom says it was the root and the bark that was gathered and dried. Edith did continue with her violin studies. In which Coralee discusses how to put on a grass roof, and anticipates the upcoming Field Council for Africa Inland Mission. Yesterday Ralph took our girls back to Rethi for their new term of school. It has been terrible; they have left such a gap. I've stayed behind because there is so much to be done. We are in the midst of repairing and also redoing grass roofs. This hot dry season is a good time as there is seldom any rain. Managing these things along with the daily routine is very hard. At the moment it is entirely up to us. I have been doing a lot of it so that Ralph will be free to see to the medical cases where he is so much needed. We wish we were rich and could afford corrugated iron roofs which are simple and fire proof. This is what it takes to put on a grass roof. Gather long roofing grass in large bundles. When a large amount (tons & tons) is in hand it has to be tied in small bundles. The natives do all this but there must be lots of supervision for they aren't naturally fond of work. Then they get bark from trees for string. The grass is tied in rows onto the framework of the house top. I've nearly cooked today standing in the boiling sun seeing that they did the tying on properly. For if done poorly the roof will always leak. 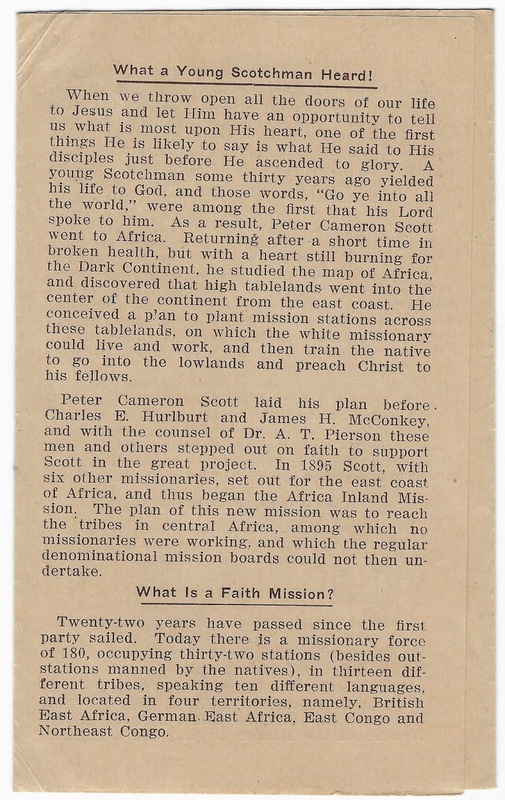 Missionary work is not just preaching from the platform. There are endless jobs that must be done to make the preaching and teaching possible! Ralph expects to be back in a few days for he will see serious medical cases at a number of the mission dispensaries. Shortly after his return the Field Council which directs the mission work here in Congo will meet here. The field is divided into districts and each district has a representative on the Field Council. Conference at Aba, date uncertain but probably in the 1930's. Ralph is in the top row on the far right. This will be a busy time for Ralph as he is our district representative. They usually meet from 9am – 12:30pm, 2-6pm, and 7:30 – 12 midnight. They meet day after day until all business in hand is settled. 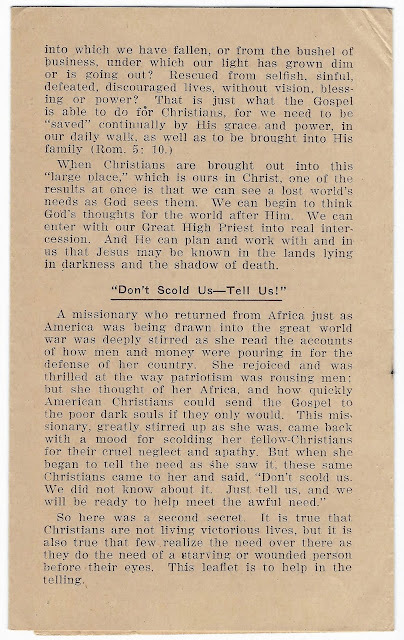 Often there are knotty problems and all is very serious business affecting the lives of missionaries and the whole work as a whole. There are 17 mission stations here in Congo and 82 missionaries. Our field covers a distance of over a thousand miles. We hope you are all well and that there is lots of joy tucked into each day for you each and every one. We truly had a good time with our girls and now that there is no music or jolly voices, or no one to come and meet me when I come home I feel like my world has changed. Now would we be willing to make this great sacrifice if it were not for the Lord’s work? Sometimes when things are difficult - and they often are - we would like to come home and have our own home and live as you do. But we know this is not God’s will for us and we really are happy in Him. He makes the storm clouds separate and He abundantly meets our needs. Although our spiritual needs are great, for Satan is truly our arch enemy here where he has been superior for so long. Material needs are great but we can truly say that God has supplied our needs. Not always perhaps just as we would like, but we have not lacked any good thing. Praise His Name! Our God is living and a loving Heavenly Father and I know that you have found Him the same. Forgive a rambling letter, I only meant to say a few lines to come along with Esther’s letter. We love you and pray for you. Write us as often as you can. Last mail came and no letter from home after 2 weeks wait. Ralph was keenly disappointed. 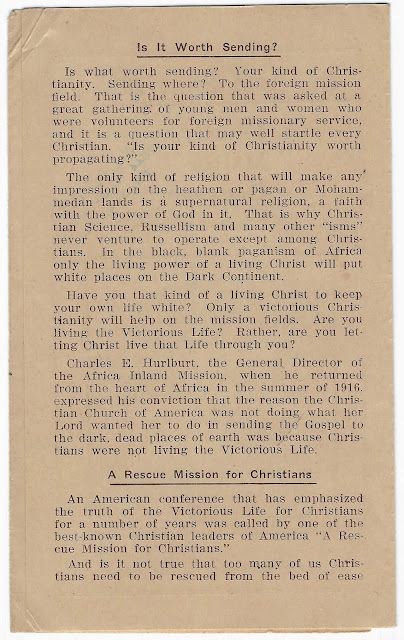 A recently acquired item from eBay, this little leaflet from the AIM gives an idea of the religious environment in the post World War I period. Estimated date of publication - based on internal references - is about 1917. I have found two references to W.L. DeGroff. He and his wife visited Moody in Chicago during December 1905 (mentioned on page 248 of the Institute Tie). 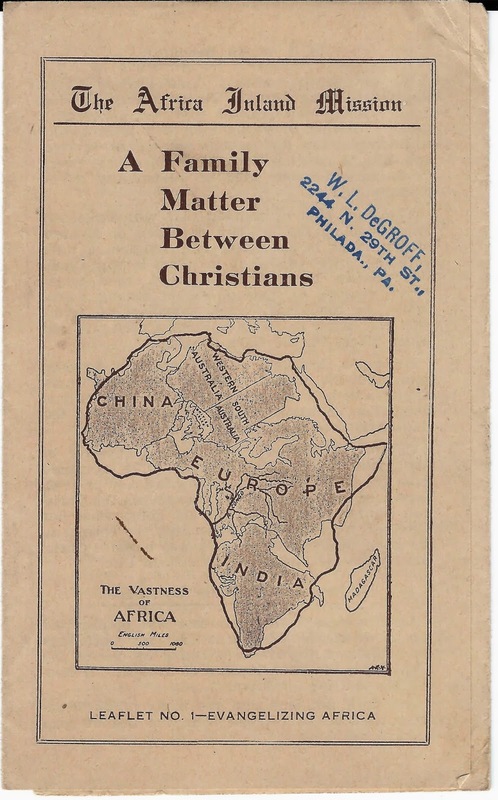 It appears he was the president of the Philadelphia Jewish Evangelization Society in Philadelphia in about 1911, as mentioned in the A.M.F. Monthly, Volumes 20-21. Amy's note: There is a gap of almost exactly a year between this letter and the previous one. Certainly letters were written, but none have come into my hands. Best wishes for 1939 even though they will reach you very late. We had hoped to get a letter off last mail, two weeks ago but life was so hectic here just then it didn't get done. We do want to send our warmest thanks to you for the lovely Christmas box which reached us before that day. We celebrated our Christmas as usual, being awakened at 3:45AM by the natives singing carols at our door. After that we dressed somewhat, and Ralph lit the candles on the tree. The candles were given to us by Mr. Miller at Rethi, as special treat to the children, for we had not had candles in several years as ours were finished. Then we began opening the various parcels that had collected. There were several local ones from various of the missionaries who are close friends. We always save the “home” parcels until last for they are always such fun. Every year you all tuck in such a lot of love and thought into your parcel. We can always read such a lot of thinking and planning in each present. Your choices for the children area always favorites. As I am writing, Edith and Esther are here on the floor playing the game you sent. Edith has her right hand in a pan of hot water for yesterday she fell while roller skating on the hospital veranda (no white patients at the moment so they take advantage of the long verandas). Ralph thinks she has fractured the end bone of her thumb. Ralph was pleased indeed with his lovely tie. And a book, that’s the thing that truly hits the spot with him. Both of us have already read the “Citadel”. It was very interesting. My dress fits exactly. Thank you very much! "Before you call I will answer" (1) was literally true of that dress, and also the bath towels. My dresses are all such queer things. I am so glad to have this new one. Then lately we have had very hard wear on our towels as there have been a lot of white patients. Even some towels more or less new have begun to split and I was just saying we would have to send soon for some more. These will indeed be a help. Our wash boys give the clothes such hard wear. They are rubbed on a washboard and they wring them so hard. Then the sun seems to nearly burn them even though we leave them out a very short time. The children have already made a lovely village out in the yard several times using the little houses and creating a very pretty effect and such a lot of fun. Thank you heaps for giving us so much love and thought. Our girls too have continued to do good work. Esther was first this time having the highest total average in the whole school, 93.5. Edith has usually been about one point higher but this time she was one point lower. They are both in grade 4. On Dec 9th we left here for a medical trip among some of our mission dispensaries. We first went to Todro, where Ralph was able to see and give help to a large number of cases. These dispensaries are all overseen by missionaries with native assistants. We visited Adi, Aru, Aja, Aungba also. Then we went to Blukwa, one of our mission stations near Rethi where it is high and cold. We had a week there and it was grand. Just to do nothing but what we wanted to do. We returned via Rethi and enjoyed the school programme. 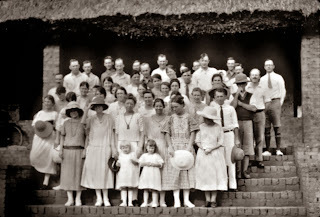 Then it was fun to bring our girls and Ruth Stam, also Mary Grimshaw home for their holidays. Mary’s parents met us at the Todro turn-off to take her in to her home. Ruth’s parents are here at Aba. We arrived home at 8:30 on the evening of the 23rd after a long tiring trip. (2) We had to stop off at Aungba and sew up a number of long gaping wounds on a native who had been gored by a wild pig (3). Then two flat tires, the last out in the “blue” where our jack and pump both failed to work properly. We finally got natives to pry up the car with poles while Ralph slipped on the wheel. The pump hose was bad but by holding both ends and a third person pumping we finally got it up enough to travel. Reaching home so near Christmas made things terribly hectic as Christmas here is always a busy time. Special native services and they have a day of games and a feast (meat and "fufu" or mush). They eat all of the cow – head, hoofs and insides. So one beast goes a long way in a crowd. We plan D.V. (4) to go again to Azandeland for surgery the first of Feb. There are more than 200 surgical cases waiting for operations (5) there. They have been hearing the "Word" daily during this waiting time and we earnestly seek your prayers for this difficult trip. It is a very hot time but we must go then as a number of white maternity cases hedge us in for some time after Feb, also various other things. Operating under such conditions is indeed very strenuous as the time is always very limited and conditions primitive. The terrible need of those poor people and the marvelous opportunity of reaching souls is the only reason we are willing to go. The Azande tribe have been a very hard tribe to reach with the gospel. They are widely scattered over a huge area. 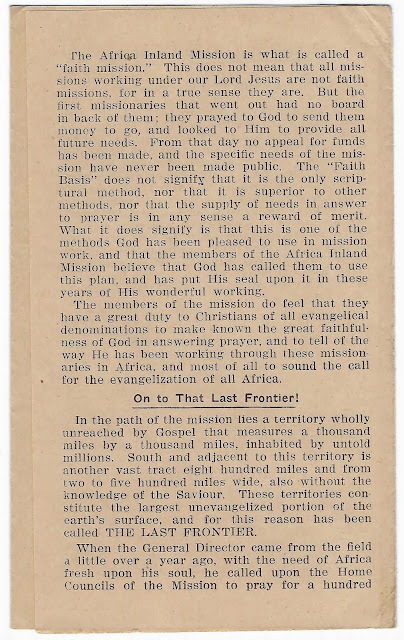 This surgical work has brought patients from long distances and it has pleased the Lord to use it in making known the gospel over a huge section. Recently several patients arrived here in the hospital from up there. They were tired of waiting and so walked to us. They walked more than 450 miles to get here. Unless some kind traveler gives them a lift back they look forward to a tramp of 350 miles (7) back to their home. Poor folks, they wring your heart in their great need. At present we have patients from all directions for which we humbly praise and thank our God. 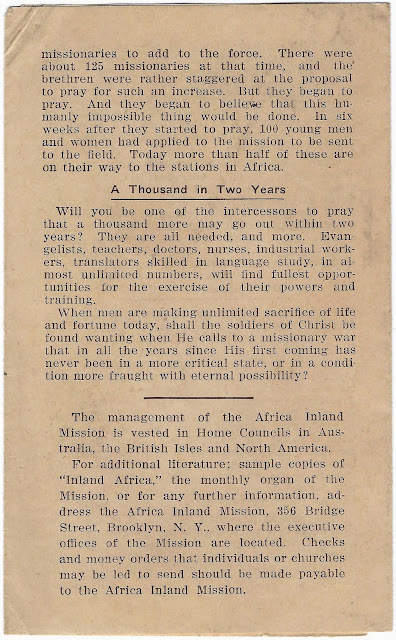 The work of years has given them a confidence in us which we earnestly pray may be the means of reaching many souls ere they are eternally lost. You should be here to see the crowds of locusts that visit us occasionally. During this hot dry season they are flying in enormous swarms. When they settle down for the night they surely do mow the place. Let us hear from you often. Remember that we love and deeply appreciate all that you have done for us all through the years. More than fifteen years have passed swiftly since we first sailed. God has truly met our every need and we praise Him with full hearts. There are of course many things that we would love to have and have not, but all our real needs have been met. He is the same yesterday today and forever. If it were not for this how could we face the future? We all join in sending our united love and thanks. Isaiah 65:24. "It will come also come to pass that before they call, i will answer; and while they are still speaking, I will hear." The round trip calculates out to about 819 kilometers. However Google doesn't know about Aja or Aungba, so I had to leave those out of the calculation. Mom commented that she and Edie always remembered this as a buffalo goring, not a wild pig. Deus Vult - Latin for "God wills it". These surgical cases were often tumors or elephantiasis cases. As mentioned in a previous letter, trauma cases often couldn't be reached in time. I couldn't find a weather station for Aba, but Wunderground estimates temperatures in the low 90's for December, with humidity readings about 60%. I can't find anything for Rethy but I do remember it (I went to school there too) as being cooler. These folks walked 100 miles to the first station (Todro?) and then had to walk back across their own tracks another 350 miles to get to Aba. I want to send a note of special greetings for the New Year and many many thanks to you all for the lovely Christmas parcel. Your gifts were all so nice, and your parcel each year always reveals to us so much thought and love tucked into it in so many ways. It is the later that means so much to us. We do increasingly value your love and prayers. The days have been madly busy for so long and since this is our worst season we are feeling very weary. We have been racing time for the hospital is full of sick folks and a large dispensary daily, as well as a number of white patients make it seem well-nigh impossible for us to get away to conference day after tomorrow. However today I withdrew from the rush and have gathered together our clothes and have done all sorts of other things just in case we can go and get out of this heat for a week. This vacation we have had some lovely times together in spite of the rush all around. They (1) have learned to sew on the machine and we have made some doll clothes and they have done a lot on their own. The other day they helped me make a cake which was a great thrill for us all. There were tears today because the precious kittens were playing and jumped up on the window sill and overturned their toy tea set. They broke almost the entire set, which Ruth Stam had just given them for Christmas. Such excitement came the other day when Ralph came back from the Poste with a big turkey gobbler in the car. I sent Amati, one of our boys, to bring it and he was hailed as a hero for not being afraid of it. The boys had no end of things to say about this bird. When I told the cook to kill it for us he said “Won’t it fight me? I am afraid of it!” Later he told me its neck was very hard to cut because it had all those bumps on it. All around us now they are burning large stretches of grassland. The fires look so pretty at night. However the soot from them makes the atmosphere very heavy and depressing and our house very dirty. It is already late and so I will close here. This is not much of a letter but it comes to you with lots of love from us all. The night before last this hill was burnt. I mean just the grass was burnt. It was a very pretty sight. Thank you very much for the lovely bubble pipes. They make very pretty bubbles. Mother said that the cats got up on the window and pushed down our nice dishes. They broke all except five dishes, the meat plate and two cups. Ruth Stam gave them to us for Christmas. One day we went over to Ruth Stam’s house. While we were there we told a native to take down a sausage from the tree. After he had gotten it down Edith made a face on it and we stuck a stick right through it for its arms. Then we gave it a bath and dressed it. We still have it.